Acid foods - Foods which contain enough acid to result in a pH of 4.6 or lower. Includes all fruits except figs; most tomatoes; fermented and pickled vegetables; relishes; and jams, jellies, and marmalades. Acid foods may be processed in boiling water. Altitude - The vertical elevation of a location above sea level. Ascorbic acid - The chemical name for vitamin C. Lemon juice contains large quantities of ascorbic acid and is commonly used to prevent browning of peeled, light-colored fruits and vegetables. Also known as citric acid. "Fruit Fresh" is the brand name of a commonly available (most grocery stores) form of ascorbic / citric acid. Bacteria - A large group of one-celled microorganisms widely distributed in nature. See microorganism. Blanching - fruits and vegetables contain chemical compounds called enzymes that cause the loss of color, loss of nutrients, and flavor changes when they are frozen or canned. These enzymes must be inactivated to prevent such reactions from taking place. Enzymes are inactivated by the blanching process. Blanching is the exposure of the vegetables to boiling water or steam for a brief period of time (usually 2 to 5 minutes, but it varies by the vegetable or fruit and it's size). The vegetables must then be drained of the hot water and rapidly cooled in ice water to prevent cooking. Blanching is absolutely essential for producing top quality frozen vegetables. Blanching also helps to destroy microorganisms on the surface of the vegetable. The water bath or pressure canning process accomplishes this when canning, so a blanching step is only needed for frozen foods, not canned foods. Blancher - A 6- to 8-quart lidded pot designed with a fitted perforated basket to hold food in boiling water, or with a fitted rack to steam foods. Useful for loosening skins on fruits to be peeled, or for heating foods to be hot packed. Boiling-water canner - A large standard-sized lidded kettle with jar rack, designed for heat-processing 7 quarts or 8 to 9 pints in boiling water. See this page for more information about why you should use a canner. See this page for pricing and models of canners, and where to get them. Botulism - An illness caused by eating toxin produced by growth of Clostridium botulinum bacteria in moist, low-acid food, containing less than 2 percent oxygen, and stored between 40� and 120� F. Proper heat processing destroys the bacteria that enable botulism to flourish in canned food. Freezer temperatures inhibit its growth in frozen food. Low moisture controls its growth in dried food. High oxygen controls its growth in fresh foods. Canners - cooking vessels to create an evenly heated environment that subjects canned goods to temperatures high enough to kill bacteria. There are two approved types: water bath canners and pressure canners. See this page for more information about why you should use a canner. See this page for pricing and models of canners, and where to get them. Canning - A method of preserving food in air-tight vacuum-sealed containers and heat processing sufficiently to enable storing the food at normal home temperatures. See this page for an overview of how canning works. Also see this page for canning methods that are considered to be unsafe. Canning salt - Also called pickling salt. It is regular table salt without the anticaking or iodine additives. Citric acid - A form of acid that can be added to canned foods. It increases the acidity of low-acid foods and may improve the flavor and color. Enzymes - Proteins in food which accelerate many flavor, color, texture, and nutritional changes, especially when food is cut, sliced, crushed, bruised, and exposed to air. Proper blanching or hot-packing practices destroy enzymes and improve food quality. Exhausting - Removal of air from within and around food and from jars and canners. Blanching exhausts air from live food tissues. Exhausting or venting of pressure canners is necessary to prevent a risk of botulism in low-acid canned foods. Fermentation - Changes in food caused by intentional growth of bacteria, yeast, or mold. Native bacteria ferment natural sugars to lactic acid, a major flavoring and preservative in sauerkraut and in naturally fermented dills. Alcohol, vinegar, and some dairy products are also fermented foods. 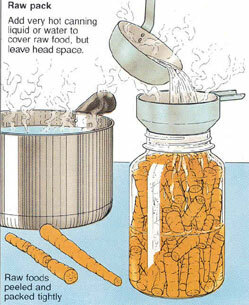 Headspace - Heat processing - Treatment of jars with sufficient heat to enable storing food at normal home temperatures. See this page for more details about headspace! Hermetic seal - An absolutely airtight container seal which prevents reentry of air or microorganisms into packaged foods. Hot pack - Heating of raw food in boiling water or steam and filling it hot into jars. See this page for more information about the pro's and cons of raw pack and hot pack methods. 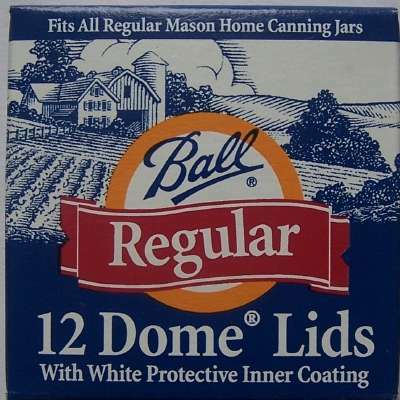 Lids, Rings and jars - see this page for a description and questions about the most common (in the U.S.) safe system for home canning, the "Ball", "Kerr" or "Mason" jar. before processing in boiling water. Microorganisms - Independent organisms of microscopic size, including bacteria, yeast, and mold. When alive in a suitable environment, they grow rapidly and may divide or reproduce every 10 to 30 minutes. Therefore, they reach high populations very quickly. Undesirable microorganisms cause disease and food spoilage. Microorganisms are sometimes intentionally added to ferment foods, make antibiotics, and for other reasons. Mycotoxins - Toxins produced by the growth of some molds on foods. Open-kettle canning - A non-recommended canning method. Food is supposedly adequately heat processed in a covered kettle, and then filled hot and sealed in sterile jars. Foods canned this way have low vacuums or too much air, which permits rapid loss of quality in foods. Moreover, these foods often spoil because they become recontaminated while the jars are being filled. Pasteurization - Heating of a specific food enough to destroy the most heat-resistant pathogenic or disease-causing microorganism known to be associated with that food. pH - A measure of acidity or alkalinity. Values range from 0 to 14. A food is neutral when its pH is 7.0: lower values are increasingly more acid; higher values are increasingly more alkaline. Pickling - The practice of adding enough vinegar or lemon juice to a low-acid food to lower its pH to 4.6 or lower. 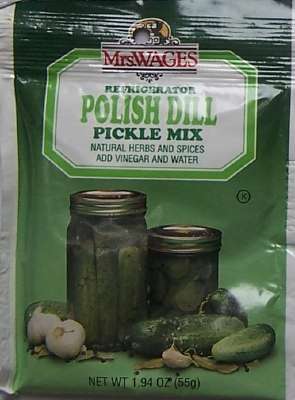 Properly pickled foods may be safely heat processed in boiling water. Pressure Canner - A specifically designed metal kettle with a lockable lid used for heat processing low-acid food. These canners have jar racks, one or more safety devices, systems for exhausting air, and a way to measure or control pressure. Canners with 20- to 21- quart capacity are common. The minimum volume of canner that can be used is 16-quart capacity, which will contain 7 quart jars. Use of pressure saucepans with less than 16-quart capacities is not recommended. See this page for more information about why you should use a canner. See this page for pricing and models of canners, and where to get them. Raw pack - The practice of filling jars with raw, unheated food. Acceptable for canni ng low-acid foods, but allows more rapid quality losses in acid foods heat processed in boiling water. See this page for more information about the pro's and cons of raw pack and hot pack methods. Spice bag - A closeable fabric bag used to extract spice flavors in pickling solution. Sealing - see this page for instructions about how to determine if the jars have sealed properly. Spoilage - the growth of undesirable bacteria, molds and other pathogens that can cause illness, injury or degrade the taste or other qualities of foods. See this page for detecting spoilage. Style of pack - Form of canned food, such as whole, sliced, piece, juice, or sauce. The term may also be used to reveal whether food is filled raw or hot into jars. Vacuum - The state of negative pressure. Reflects how thoroughly air is removed from within a jar of processed food; the higher the vacuum, the less air left in the jar. The presence of a vacuum, by itself, does not indicate that the jars are sterile or safe. Some people simply invert jars that are filled with hot product and sealed. That will form a vacuum and seal the lid, but the contents are not sterile, nor considered safe. They require water bath or pressure canner processing after the lids are put on! 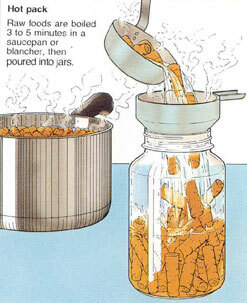 Water Bath Canner - see drawing - Essentially, a very large pot with a rack to hold jars. Acid foods such as fruits and tomatoes can be processed or "canned" in boiling water (also called the "water bath method"). See this page for more information about why you should use a canner. See this page for pricing and models of canners, and where to get them. Yeasts - A group of microorganisms which reproduce by budding. They are used in fermenting some foods and in leavening breads.